Roseville, Calif - An encased American flag that was to be presented to a Veterans widow, was stolen in an Roseville residential burglary. The keepsake, which was going to be presented this coming weekend was stolen between 6 p.m on Friday, April 14 and 1 a.m. on Saturday April 15. The unknown thief entered the open garage in a neighborhood near Woodcreek Oaks Boulevard and Baseline Road and stole several items, including a United States flag in a case. 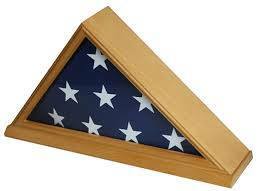 The flag is a service flag for an Air Force veteran who will be laid to rest this weekend. The flag was for presentation to the veteran's wife of 25 years during the burial service. If you have any information on this burglary or the whereabouts of the flag, please email CSO Giannini at sgiannini@roseville.ca.us. No Comment to " American Flag For Veteran's Widow Stolen in Roseville Residential Burglary "